In the past, searchers would use short-tail keywords to find the information they are looking for, and search engines supported those types of user behaviors. Today, users are performing much more diverse search queries to find information. In fact, there are billions of unique search queries performed every day on terms nobody has ever searched on before. These queries tend to be long-tail or extra long-tail. If you are obsessing about ranking for short tail terms, you are missing out because people are searching in much more diverse ways, and with much longer queries. It doesn’t make much sense to monitor thousands and thousands of keywords people are finding your site with that only get 1 search per year; meanwhile the short-tail terms are getting searched on less and less. Internet technology changes drastically each year. The technology available to people today is far more advanced than what was available two years ago. It’s also becoming much more affordable and available. With that, the Internet access penetration is on a sharp upward trend in countries across the world. Since technology has become more available to people, literacy of these devices has greatly increased. Long gone are the days of Windows 3.1 and the Netscape browser with a 58k dialup connection. Devices are easy to use and connections are fast. The increase in technology literacy has paved way for people to become more proficient with using search. User behaviors are constantly changing to conform to technology improvements and increased device literacy. 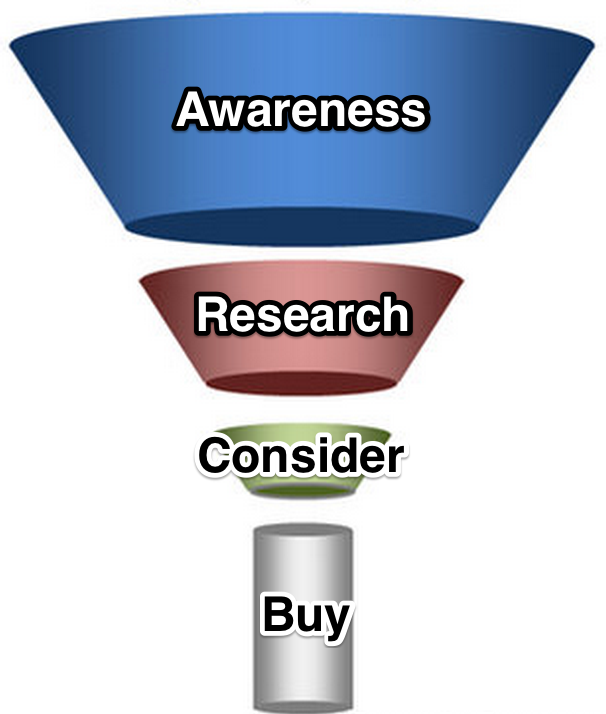 Short-tail keywords mainly tap into the consideration and buy stages of the buying cycle. At this point, competitors have already been put in front of them, and their likelihood to convert into a customer decreases. The shorter-tail terms are the ones that will still work well for product or service pages on the site, but what if you can convert the user before they even reach the consideration or buy stage? That’s where long and extra long-tail search queries come in. If you create pieces of content that reaches and informs users during the awareness and research stages, you just put your brand in front of them long before they start researching competitors. You answered their question, you put your brand in front of them, you established yourself as an authority in the subject matter, now they will want to do business with you. Content like blog posts, articles, white papers, etc. tap into those longer-tailed terms in the early stages of the buying cycle. You may have noticed that most of the posts on the MWI blog end with a call-to-action, but none of our blog content is self-promotional. This is because companies are looking to improve their marketing strategies, and want to know how. We are offering valuable content, putting our brand in front of them, and giving them the next step if they are ready to take action. So why focus on keyword rankings? Who cares! How you rank for a small set of keywords doesn’t matter when there are millions of other keywords you are already ranking for that drive both traffic and conversions. Want to learn more about how MWI can help improve your website users convert? We are here to help! Learn more about our SEO, conversion optimization, and content marketing services.